We have kicked down the Dungeon doors and the search for Loot and Fame is about to begin. Sure, we expect to run into some Monsters along the way, but that's all part of the adventure! Munchkin Dungeon is an exciting push-your-luck game with amazing, highly detailed miniatures of the Heroes, Monsters, and Bosses. Designed by Eric M. Lang and Andrea Chiarvesio, they kept the excitement and sense of humor that fans of Munchkin have come to expect in a totally new game play experience. 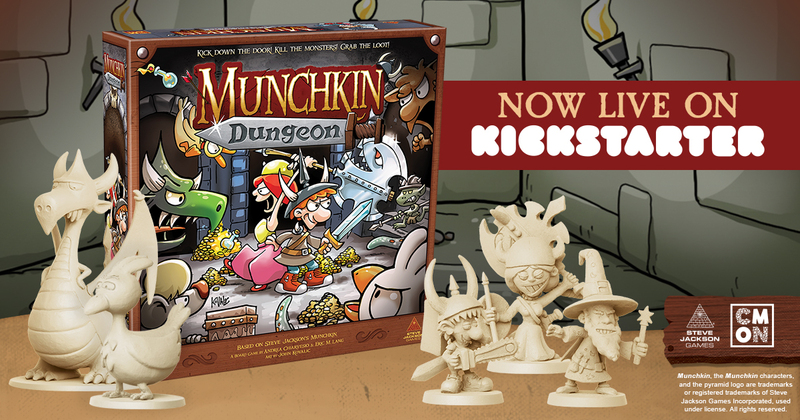 The Kickstarter for Munchkin Dungeon is now live. Visit the campaign page for all the details and to make a pledge. Stay tuned to the CMON Facebook page for updates.